We read the story of the Nutcracker this week. It seems to be the year for the Nutcracker. Last year we decided to make the journey into the city to see the annual department stores' Christmas Window Display, the children had a great time and so we have continued with what may become a new tradition for us and ventured in (by train this time) to see what the window had in store for us this year. This photo isn't great, the sun was still up (just) and the windows had a lot of glare. This is the Candy Land scence. Whilst shopping for a few last minute christmas items we stumbled across some wooden nutcracker dolls on clearance. At 50% off I couldn't walk past them. So the children spent the afternoon painting their very own Nutcrackers. They are a great size too! We then went hunting for other Nutcracker things in our christmas box. We found a disney dvd that had a short nutcracker animation and also watched this one on you tube. Plus we found some printables online, this one at Printables 4 Kids are paper dolls to be coloured and these over at Kid Sapiens are full colour. Your wooden nutcrackers are darling. We love all things nutcracker in these parts. My daughter just finished her recital (snowflake dancer!). Merry Christmas to you! They did a great job painting them, very nice. Thanks for all Nutcracker resources! We are going to see Nutcracker on Wednesday, and I am very curious to see how Anna likes it. 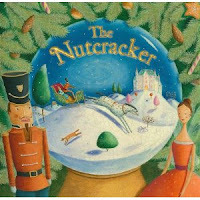 We have a couple of Nutcracker books that we are reading now to give her an idea what's going on.